FormAll® water soluble drawing compounds contain emulsifying agents that allow the oil to form a stable mixture with water. Lamson FormAll® water soluble oils are divided into two categories, chlorine based lubricants and chlorine free lubricants. Both types of lubricants form a stable mixture with water. 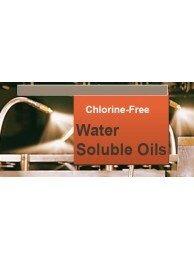 Diluting with water reduces the cost and increases the cooling power far beyond that of a straight oil. Since these lubricants mix with water, cleanup of the parts and work area are much easier. Light duty water soluble stamping and drawing oil. Our lightest duty compound formulated to rep.. Medium duty water soluble stamping and drawing oil. Our medium duty compound heavily formulated.. Heavy duty water soluble stamping and drawing oil. Our heaviest duty compound formulated to rep.. Regular duty water soluble. This standard light-to-medium duty oil can be applied with mixing r.. Medium duty water soluble. Contains more EP additives to handle medium-duty jobs. Excellent for.. Heavy duty water soluble. For the heaviest application (including deep drawing work). Contains .. Designed for aluminum stamping and welding. A water-soluble drawing compound that’s exceptional..
Laminating lubricant. An oil which allows for dilution ratios up to 20:1. Provides superb lubri..